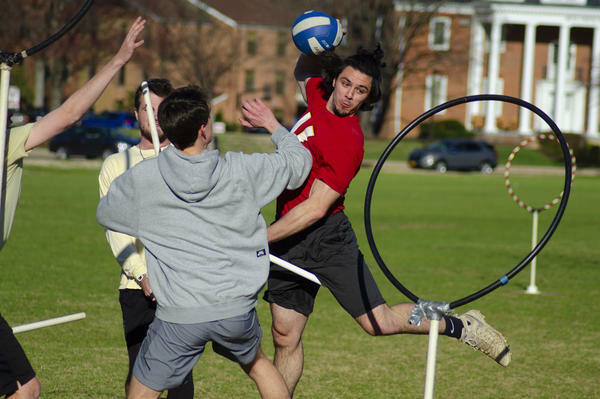 Quidditch is a fast-paced, co-ed, full-contact combination of dodgeball, rugby and basketball. Above, John Sheridan tries to score points by throwing a quaffle ball through the other team's hoop. Before 2005, quidditch existed only as a creation from the fictional world of Harry Potter — a pastime for witches and wizards on flying broomsticks. But charmed by the game's allure, students at Middlebury College in Vermont held the first real-life quidditch match, a fast-paced, co-ed, full-contact combination of dodgeball, rugby and basketball. Nearly a decade-and-a-half later, participation has grown dramatically, with teams sprouting up in communities and college campuses across the country. The sport has its own governing body, U.S. Quidditch, with 134 teams already registered this season and another five to 10 more added each year. But as teams gather in Texas this weekend for U.S. Quidditch Cup championship, players, coaches and officials are increasingly grappling with how to minimize risk in a game where the potential for injury has become more and more apparent. Many have come to realize it's not just scrapes and bruises — it's also broken bones and for some players, concussions. The real life game of quidditch is similar to the fictional sport, sans the flying broomsticks. To make up for that, players run with a piece of PVC pipe between their legs, sprinting up and down the field with as many as five balls in play at a time. There are seven players to a team. Three "chasers" try to score a volleyball through hoops on both sides of the field, each set defended by the opposing team's "keeper." Just as with the rules of quidditch from the Harry Potter series, in real-life quidditch, once a seeker catches the snitch, the match is over. While the chasers focus on scoring, two "beaters" try to stop them by either tackling them or throwing dodgeballs at them. Meanwhile, a seventh player, the "seeker," goes after the ultimate prize: the snitch. Once a seeker catches the snitch, the match is over. Matches can be intense. Players run at full-speed without any required protective equipment other than a mouthguard. And because the game is co-ed, players of all gender are tackling each other. Injuries can follow. Broken collarbones. Broken thumbs. Broken Noses. And concussions. Amelia Gurley, a former quidditch player, has seen these types of injuries too — particularly as the sport has grown more competitive. A medical student at Brown University, Gurley is now trying to answer a fundamental question: how dangerous is quidditch really? In February, she began work on what she hopes to be the first international quidditch injury survey. John Sheridan (left) lunges to steal the ball from Dan Reise. "I worry," she said. "We're a new sport. No one's really even looking into this." To date, the most comprehensive data comes from a 2017 study by researchers at the University of Edinburgh who surveyed roughly 50 percent of all quidditch players in the United Kingdom. The study revealed a mixed picture. While overall injury rates were no higher than in other recreational sports, concussions accounted for more than 20 percent of all injuries. 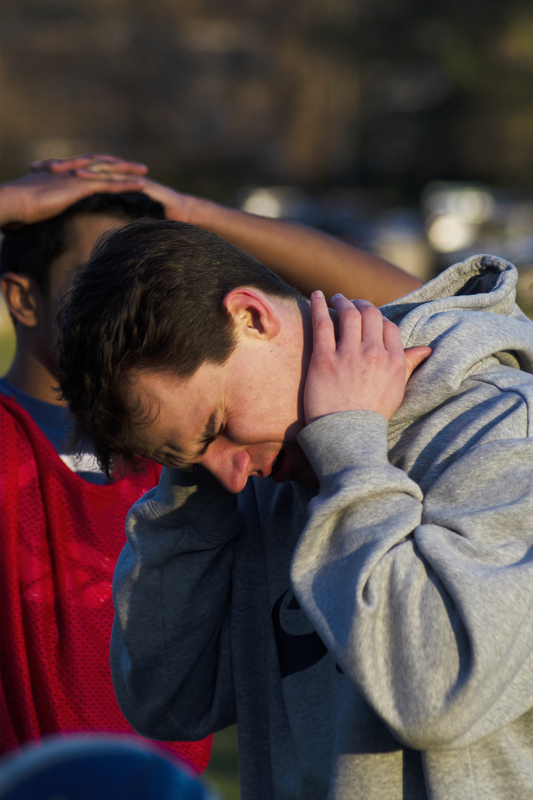 That made concussions the second most common injury overall, according to Ashley Cooper, one of the study's authors. Sprains were the most common injury, at roughly 26 percent. Lacerations, at about 18 percent, were the third most common injury type. The authors called the study's concussion numbers "relatively high when compared to other full contact sports." For comparison, the study noted that the concussion rate in professional rugby was between 3 percent and 10 percent of all injuries. Caleb McConnon rubs his neck during practice. According to a study by researchers at the University of Edinburgh, concussions account for more than 20 percent of all injuries in quidditch. Above, players stretch during a quidditch practice at the University of Maryland. Men and women are injured at roughly the same rate, according to the study, but women experienced concussions at nearly double the rate as men. There are still no studies of injuries in U.S. Quidditch, making it difficult to tell how safety compares in the U.S., where thousands play the game, and the U.K., where the number of players is estimated in the hundreds. USQ declined to provide specific injury data, but Sarah Woolsey, its executive director, said the league was aware of the concussion risk and noted that medical personnel are required to be present at every official USQ game. "Every single certified coach in our league is required to complete a concussion training webinar," Woolsey said. "If any player is suspected of having a concussion ... they're immediately removed from play and cannot return to play unless they are cleared by a medical professional." For newcomers to quidditch, the physical nature of the game can be eye-opening. "I thought it'd be a load of super fans with scars on their heads running around the field," said Cooper, referring to Harry Potter's trademark scar. A quidditch player himself, Cooper said he got "absolutely battered" playing the game. "I thought if it was contact it'd be these asthmatic nerds running around and it wasn't." One of the biggest debates in the sport is about tackling technique. USQ rules only allow one-armed tackles, but some players have begun to wonder whether two-arms would be safer. 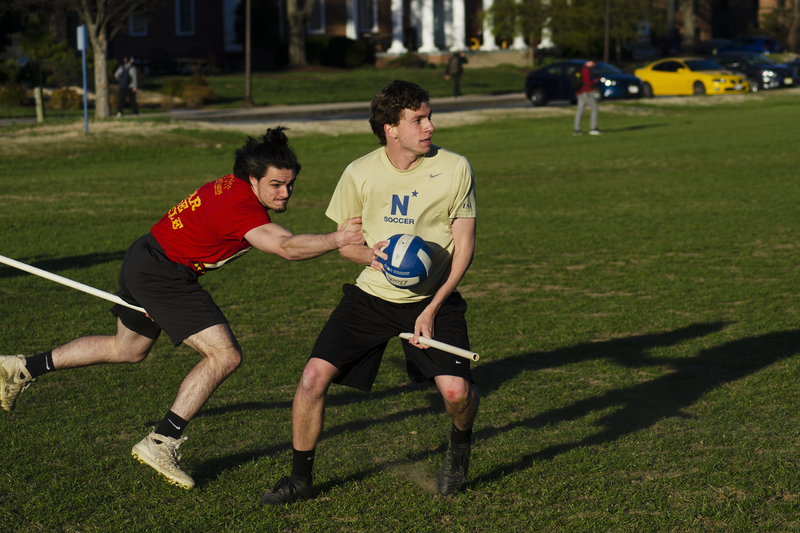 "When you have the broom in one hand and you're trying to make a tackle, it makes it awkward, you have to twist or fall backwards and throw them over you," said Mack Morgan, a co-captain of the University of Maryland quidditch team. "With a two hand tackle there's never really going to be that twisting motion." Morgan said that many of the injuries he sees on the field — like torn knee ligaments, broken collarbones and concussions — come from that twisting motion. Woolsey declined to say whether USQ was considering two-armed tackles, but pointed out that USQ players are required to sign a waiver that states that quidditch is a full contact sport. Another topic of debate is the co-ed nature of the game and whether it's safe for differently gendered people to be tackling one another — not only because players don't wear protective padding, but also because of the size differences between players. "One of the parts of the rules deals with reckless or excessive force," Woolsey said. "Our athletes understand it might take a different amount of force to tackle somebody who is smaller versus somebody who is bigger." Many players say they'd be reluctant to eliminate co-ed play. Many say they were drawn to the sport because of how inclusive it is for people of all genders, including those who identify as nonbinary. "It's nice being able to play sports with people of all genders and all backgrounds," Gurley said. 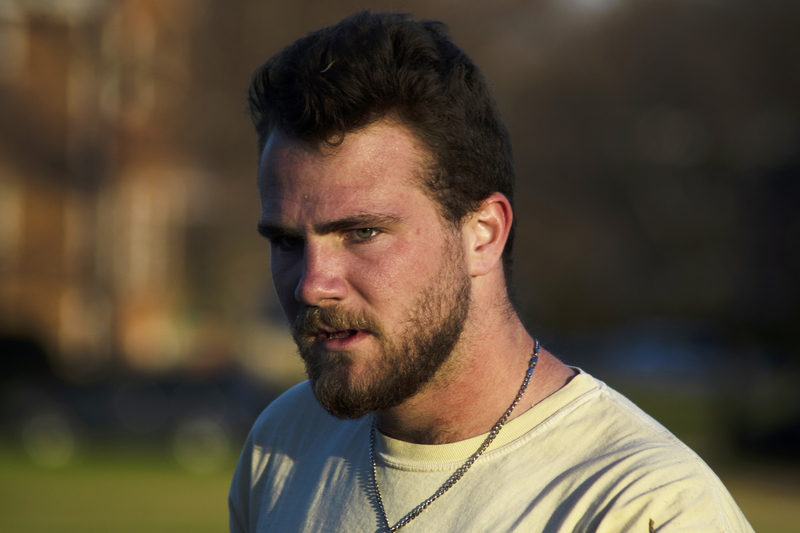 University of Maryland quidditch co-captain and chaser/keeper Mack Morgan catches his breath after a competitive team scrimmage. Rules are typically updated every year, Woolsey said, based on feedback from players and internal data about injuries gathered at every official USQ game. She said she thinks quidditch is approaching a point where the rules are more permanent, but will still probably change a bit. "Even sports that have been around for over a hundred years make changes," she said. 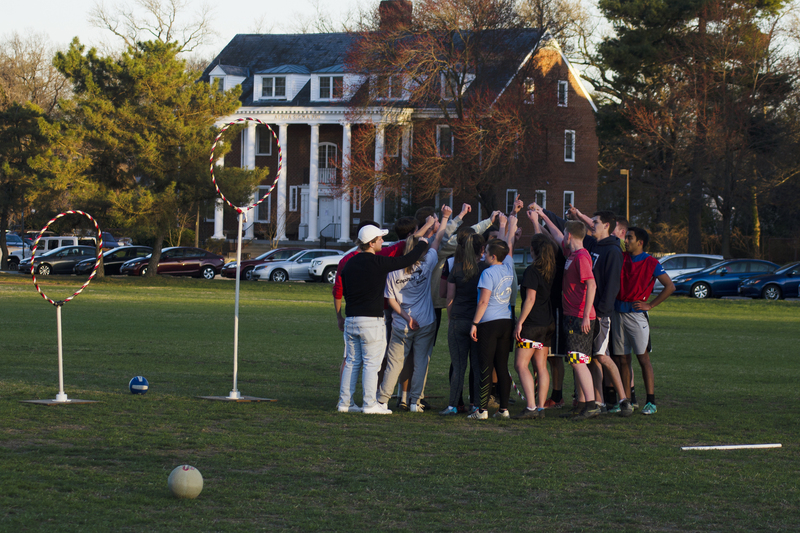 Members of the University of Maryland quidditch team gather at the end of a recent practice. Though research is limited, some who play the game are starting to think more seriously about whether the rules of the sport need to be reevaluated. But as Gurley from Brown University pointed out, there are still many quidditch teams across the country that are not affiliated with USQ. So even if USQ were to make changes, those would not necessarily have any impact for players on non-USQ teams. Gurley's former team, the Providence Ashwinders, is not an official USQ team, so it doesn't need to abide by USQ regulations. Once, she remembers a game that her team played where an EMT was not present until halfway through the tournament. "Different people in different places are playing quidditch differently, which can be great," Gurley said. "But it can also be dangerous when it comes to things like safety ... We're not wizards. We can't fix that kind of stuff with a wave of our wands." Editor's note on April 24: This story has been edited to remove references to a Quidditch player who says she did not agree to be quoted.